TENA Men Incontinence Pads designed specifically for light to moderate male incontinence. TENA’s range of Incontinence Pads for Men are of the highest quality, being manufactured by a world-leading supplier of reliable incontinence products. Designed specifically to help men manage light to moderate male incontinence, the Level 1 to 3 TENA Men Pads are designed to be worn discreetly within the user’s own underwear, providing a close body fit for increased comfort and security. TENA Men Level 4 Protective underwear is a disposable pant specifically for Male Incontinence. Although more prevalent in older men than younger ones, male incontinence is a condition affecting millions of men of various age groups. Caused by various factors including as bladder issues, urethra blockages or the removal of the prostate gland, the right products render the condition far easier to manage. The TENA range of Mens’ incontinence pads and pants are a proven brand, effective at helping those experiencing continence issues to lead a normal and confident life. Featuring various absorbency levels catering to different needs, the TENA Men range of incontinence products also includes discreet, disposable, protective underwear designed specifically for men, and suitable as an additional level of protection for less mild incontinence cases. We also offer a series of TENA Incontinence Pad Case Savers allowing for higher quantity purchases at lower prices, the perfect solution for those seeking incontinence supplies lasting for longer periods. All TENA Men products come with the added bonus of odour control technology and a ‘Fast Dry Core’ absorbing liquids quickly, keeping users feeling dry. 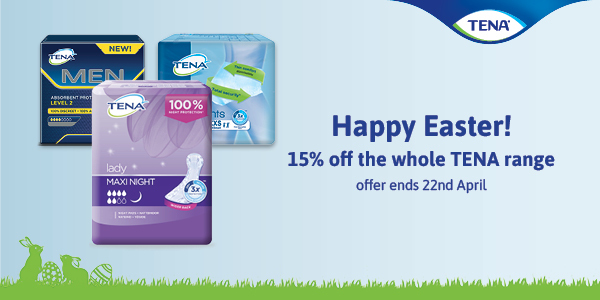 You can see our full range of TENA Men incontinence products by browsing the products below.